Who says dreamers cannot make it big?! 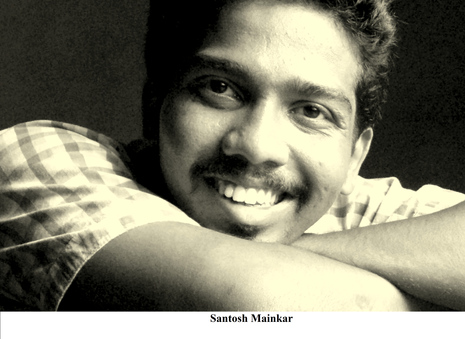 Santosh Mainkar was a typical Mumbai boy with high aspirations. Through hard work and persevering constancy, he has gradually climbed the rungs of cinematic fame. This Economics graduate from Mumbai University had a strong inclination towards becoming a thespian from his college days, but fate had a slightly alternative calling in store for him. On completing his higher secondary schooling, he became a regular participant in theatre and this is what primarily set him about patterning his career course in the direction of acting. The current of destiny forced him on a different route when he directed a Marathi street play for the NSS whilst still in college. The street play, which was performed at Kirti College in Dadar, obtained second place. The success of the play proved his directorial prowess. From then on it was about script writing and direction for Santosh. His first documentary was Dhoop, which won first prize at Elphinstone College. His second documentary, Mumbai- The Other Side of Your Dreams, was in the top twenty five at the MAMI (Mumbai Academy of the Moving Image) Festival and was screened at INOX. Positive Mumbai is another one of his award winning short films. Santosh has aided television serial writers with their scripts and assisted in the direction of Marathi serials such as AD Venture Cup, Maziya Priyala Prit Kalena, Ajunhi Chand Rat Ahe and Aarambha, on various Marathi television channels. Santosh moved up to film direction by assisting director Milind Pednekar in Tamasha Hach Khel Udya Punha, a movie based on lavani (traditional song and dance of Maharashtra). He has also assisted in the direction of Ashach Eka Betavar by Sanjiv Hinge. Switching roles from direction to writing, Santosh is the associate writer for upcoming film Ardhanari Nateshwar. The process of Prem at First Sight’s evolution began in Goa when Santosh had come from Mumbai in January 2014, to participate in a drama competition. Here he was asked to meet actor and producer Uday Salkar. ‘Uday Salkar wanted a commercial film with different elements. I discussed it with Chetan Kinjelkar, my writer, and we came up with a plot based in Goa. We used an incident of a building collapsing as a backdrop and brought in a builder… brought in politicians. Uday Salkar liked the story,’ says Santosh, with an undertone of satisfaction in his voice. From then on they worked relentlessly for about one and a half months on the screenplay. They began shooting on the 20th of May and in twenty to twenty five days they had finished filming. Santosh explains the need to expedite the completion of the shooting. ‘The stringent budget allocated to regional films compels us to finish shooting at the earliest time possible,’ he enlightens us. True to the format of commercial cinema, Prem at First Sight has the usual offering of song and dance. The first song of the film, Savar Tu, is a love song that plays in the background when the main protagonist, Adi, is smitten by Sai at the first instance. There is a children’s song, with a performance by the hero and children. The trending item song also finds its place in the film, starring Goan model, Dawn Mortimer. The last song in the film, Jaganyasathi Josh Aala, emphasises the value of friendship. The lyrics of the first song were written by Santosh Mainkar while the other three songs were the output of Anand Tari. The musical score for all the songs has been provided by Mukesh Ghatwal. When questioned about the need for music in every Indian film and whether Indian cinema would ever get past song and dance sequences, he answers, ‘It depends on the film and the storyline of the film. If it is a commercial film then it is all about keeping the audience entertained. This is a totally commercial film and so songs are necessary for entertainment.’ He believes item songs have become an essential attraction to draw an audience. Art films, which are far more serious and are fundamentally cinematic creativity at a subjective level, certainly do not require the embellishment of songs. Santosh reveals his own leanings towards art films and confesses that he would prefer doing serious cinema in the future. This is not surprising given that his initial taste of success did come from documentaries, another aspect of serious filmmaking. He vouches for the success rate of the usually sidelined art cinema. He says, ‘There are Marathi artistic films that do well at the box office too. Promotion matters.’ Besides regional language film directors can avail of subsidies and satellite rights. Santosh is very grateful to director Milind Pednekar for giving him the opportunity to assist him and get his foot in the door in the sphere of Marathi cinema. He says Sameer Surve, whom he assisted on Shree Partner and writer/ director Narayan Gondal have encouraged and inspired him to a great extent. He speaks very highly of the professionalism of his cast members Sumaydh Gaikwad, Shweta Pagar, Suchet Gavai, Samiksha Desai, Aryan Khedekar, Uday Salkar, Satish Gavas, Rajesh Karekar, Kevin D’mello, Vishwajit Phadte, and Dawn Mortimer. He recalls a fight sequence between Sumaydh Gaikwad, the hero, and Vishwajit Phadte, the villain. In a miscalculated move, Sumaydh Gaikwad was thrown to the ground and hurt his back. Santosh wanted to halt the shooting and exclude the scene from the movie. However, Sumaydh stood up and told him to proceed with the shooting. Santosh commends actor Kevin D’Mello for speaking Marathi in the film when he has never learned the language. He was particularly impressed by his cast from Goa, which includes Samiksha Desai, Aryan Khedekar, Satish Gavas, Rajesh Karekar, Vishwajit Phadte and Kevin D’Mello and praises their acting skills. Santosh Mainkar has come a long way in a short time. This twenty seven-year-old had his maiden film as a director, Prem at First Sight, screened at IFFI. We wish him all the success in his future cinematic undertakings.